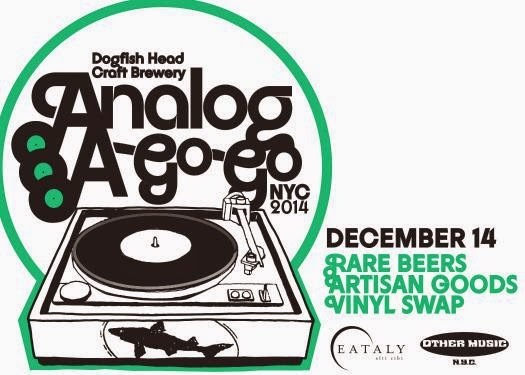 We’re taking Analog-A-Go-Go – our world-famous vinyl swap/rare beer fest – to New York City! That’s right, on Sunday, Dec. 14, all that vinyl that Analog is known for, all those rare beers, all that live music, and all those artists and artisans are taking over La Birreria, the rooftop brewpub of Eataly NYC, near Madison Square Park. * Panna Cotta Porter: Inspired by Mario Batali’s favorite panna cotta recipe, this rich, chocolatey English-style porter is brewed with black treacle and golden syrup, fresh ground ginger and nutmeg, sea salt, lactose sugar and Mario’s special Roma blend espresso. * 75 Minute IPA: An animated blend of 60 and 90 Minute IPA dry-hopped with whole-leaf Cascades and cask-conditioned with maple syrup. * Analog Beer: A roasty stout brewed with popped buckwheat and apple ash. This dry stout has subtle hints of char and smoke that meld beautifully with the bittersweet chocolate notes of black malt and roasted barley. * Vintage Fort and Chateau Jiahu: We’ve dug out some vintage bottles of Fort and Chateau Jiahu from the stash of Dogfish Head Founder and President Sam Calagione. Fort is a Belgian-style ale brewed with a ridiculous amount of raspberries, and Chateau Jiahu is one of our ancient ales based on a 9,000-year-old recipe from northern China. Artwork by Tara McPherson adorns both labels. The vinyl side of Analog NYC is being curated by Other Music, the renowned NYC record shop, which will be stocking a special holiday vinyl market with their favorite albums of 2014 on LP – 25 of the very best new releases and 25 amazing reissues – as well as a great selection of classic albums, box sets and other gift ideas. They will be joined by HPRS Records, who will be bringing an exciting mix of vintage used LPs and collectible vinyl. Other Music DJs will be spinning selections from their top albums of the year, leading up to a very special performance from Steve Gunn. * Turntable Lab: All the gear for DJs and vinyl fanatics, including headphones, record bags, slipmats and more. * Grain Surfboards: Locally grown, hand-built surfboards from York, Maine. * Woolrich: Men's and women's clothing that has embraced the outdoor lifestyle since 1830. * Tara McPherson: New York City artist who creates images and toys about people and their odd ways. * Heidi Lowe: Innovative contemporary art jewelry gallery exhibiting works by owner Heidi Lowe and numerous artists from around the world. * Public - Supply: Committed to making distinctive, high-quality products, and to making a difference by giving public school teachers the resources they need to help their students grow through creative work. * Sid Vintage: Men’s and women’s vintage clothing. * Meg McIntyre: Hand-crafted 45 boxes. * Yusuke Okada: Album-inspired drawings. * Coral & Tusk: Embroidered home goods and accessories based on original artwork. Their creative process is a special alchemy of illustration, embroidery in India and hand-finishing in Brooklyn. * Juniper Ridge: Juniper Ridge is the only fragrance distillery in the world that makes 100% natural colognes and perfumes from beginning to end. Harvesting plants in the mountains of the American west, distilling aromatic oils and making wildcrafted fragrances using ancient perfume-making techniques, Juniper Ridge's wilderness perfumes bring you the mountains in a bottle. We’re running two sessions of Analog NYC, one from 2-5 p.m. and one from 6 to 9 p.m. We’re only selling 150 tickets per session, so jump on those tickets now. Get yours here.